The hydraulic clamping system, a key part of Stanley Engineered Fastening’s QDC setup, employs hydraulically actuated die lifters and also uses air pressure to maintain force on the clamp. Little parts are a big business for Stanley Engineered Fastening, a Stanley Black & Decker company, with global operations in Asia, Europe, South America and North America serving a range of industries. High-volume clips for a long list of major automotive companies, made at its 133,000-sq.-ft. Montepelier, IN, facility, represent an important part of Stanley Engineered Fastening’s product portfolio. At the Montpelier facility, achieving fast production ranks high among Stanley’s objectives. 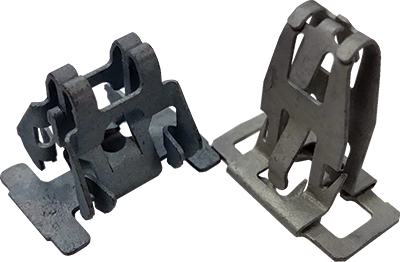 Challenges are many as multiple mini clips with multiple bends, used for air bags, grab rails, body panels and other applications, require complex progressive dies, according to Mark Gray, a 14-yr. stamping veteran and 3-yr. plant manager at Stanley Engineered Fastening. Gray credits a Seyi SM2 straightside press equipped with a complete quick-die-change (QDC) system by Pacesetter Systems, Valencia, CA, for enabling his plant to produce a range of mini parts with orders stretching from 5000 to hundreds of thousands. “Our stamped metal fasteners require long dies with many stations,” says Gray, explaining that the Seyi press and its 84-in. bed makes possible the progressive dies required for the complex bends, while the QDC system facilitates faster changeover between part runs. 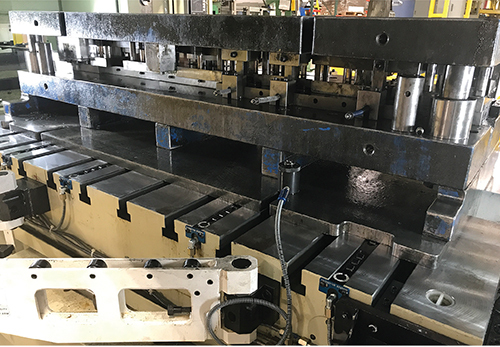 The QDC system, with its hydraulic in-bolster die lifters, bolster extension and hydraulic die clamps, has enabled Stanley to reduce setup times from 52 min. to just 31. A swing-down bolster extension enables easy retrieval by die-transport vehicles. The hydraulically actuated die lifters lift and assist movement of the dies on the press bed. 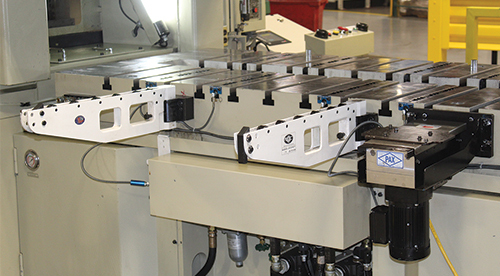 Dies are rolled from the press bed onto the removable, swing-down bolster extension for easy retrieval by die-transport vehicles. And, hydraulic die clamps mount in T-slots on the clamping surface. Achieving faster die changes also meant standardizing plates, bolts, clamps, etc. “There can be 20 different ways to clamp a die,” says Gray, “so we must keep everything standard so that we don’t lose time looking for bolts and clamps. All of our QDC efforts are important because we’re producing many different parts of varying quantities—from as few as 5000 to as many as 300,000. High-retention metal fasteners for an automotive airbag are among the many mini automotive parts produced by Stanley Engineered Fastening in Montpelier, IN. Responsible for helping Stanley meet its QDC needs is Dave Defrees, application engineer for Press Automation, distributor of Pacesetter Systems, and 34-yr. partner with Stanley. “Safety is an important factor when it comes to changing dies,” says Defrees, citing the system’s clamping technology as an example. “With this system, hydraulic pressure is used to stretch the bolt. Then it’s screwed tight with air pressure maintained on the bolt. This is safer than a straight-up hydraulic system where, if the hydraulic pressure fails, you lose the clamp.